To give your home that extra special look, several configurations are available. For the front of your home, choose from a simple door with single or double sidelites or even a double door. Also, you could opt for a garden door that opens to your backyard with a sliding screen. Each of these options allow for a transom to be installed above your door. These transoms can be rectangular or any shape you desire. With our steel doors’ versatility, you can add your own special touch to your home. Nothing is left to chance. The sophisticated, elegant design and the attention to detail during assembly give your door the personality you desire. Personalize your home with a richly coloured door combined with one or two sidelites. Add an exceptionally designed stained glass and you start to see the unlimited possibilities we can offer. Solid 4 5⁄8 or 6 1⁄2 inches pine frame assembled with screws. Double compression and magnetic weatherstripping system. 18 inches wooden block to firmly support the more elaborate handles and the safety lock. Our specially formulated thermoset polyester finish provides improved scratch resistance (white doors). Superior quality ball bearing hinges. Standard colours: brass or nickel. 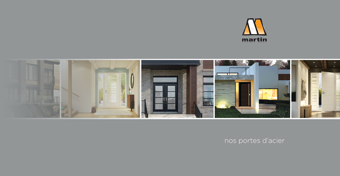 Our impressive choice of combinations lets you choose the door model, glass, frame cladding and color. The only limit is your imagination. Panels N700, the superior line. Higher definition embossments. No need for elevated molding. Increased thermal value. Fiberglass option: visit your nearest Martin distributor. Frame has 2-sided sealed joints to reduce risk of water infiltration. The raised panels made with extruded aluminum appliqué give your home a refined appearance. The MSA-1 Confor-Air door is delivered with all the hardware needed. It has reinforced aluminum corners, triple-pivot hinges and an extruded aluminum frame (2 x 7/8 inches). Sturdy wooden door sill cladded with extruded aluminum (1,78 mm) and a 6 degrees slope. Thermal break that offers ultra-efficient water evacuation. Standard sill colour: Aluminum gray. For superior resistance and luster, our claddings in extruded aluminum are certainly the ultimate choice to clad your frames. The thickness of our extrusions (1.78 mm) is much higher than the aluminum flat stock offered on the market. Our extrusions are painted and baked in our oven ensuring a more resistant finish quality. We can also provide you with a PVC factory painted exterior finishing molding. Optionally, our steel doors and frame cladding (both extruded aluminum and PVC) are painted in our factory by a sophisticated and proven process. We apply 2 (PVC) to 3 (steel and aluminum) coats of high quality acrylic polyurethane paint offering unmatched resistance and luster. At our factory, our colorists can do for you the color of your choice, leaving free rein to your imagination.